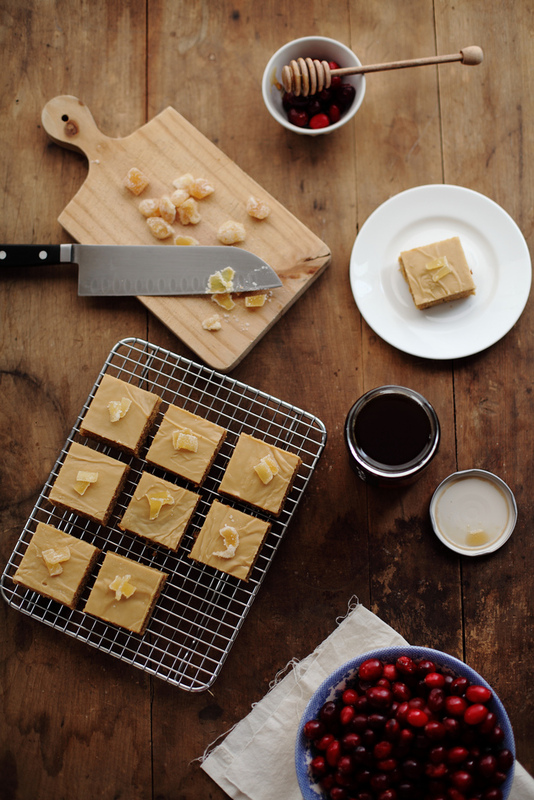 Triple Ginger Squares — always with butter. Valentine's Day has come and gone. The bakery was the most crazy I had ever seen it. I got their at 6 am and was going nonstop for the next 8 hours. We couldn't keep enough in stock, people were just walking in, buying by the dozen. The clipboard of orders was overflowing. I am still recuperating. pre-made grocery store cakes. But coating them in the most amazing molasses glaze and cutting them into little squares changes everything. The cake has black pepper in it. This was something I found very unusual at first. I didn't know if it would give the cake a strange flavor. It didn't at all, it made the cake better. It had a very wonderful ginger flavor with a nutty, spice tone that you really couldn't place. I'm no foodie who can go, Oh the floral note's in this make blah blah blah. I don't know things like that. I know what tastes good to me. And somehow the pepper in this makes the cake magical. I had found a black pepper cake recipe in an old cookbook at my great great aunt's house. Thinking it was just absurd at first, I now fell I must bake it. I am so intrigued by the black pepper in sweet items. I got a wonderful note in the mail today from a friend who moved away. It made my day. Sometimes you can go months with out seeing someone, you might still text often but you haven't really seen that person in a while. But getting that note in the mail tells you nothing has changed. Just because you on the other sides of the state doesn't mean anything. You are friends, and nothing is going to change that. Position a rack in the center of oven. Preheat oven to 350 degrees F. Butter and line the bottom of a 13x9x2-inch baking pan with parchment or waxed paper. Butter the paper; set aside. In a medium bowl, combine the flour, baking powder, ground ginger, fresh ginger, black pepper, and salt; set aside. In a large mixing bowl, combine the butter and granulated sugar. Beat with electric mixer on medium speed about 2 minutes,until light and fluffy. With mixer on low, beat in honey and molasses until well incorporated. Beat in eggs. On low speed and making three additions, beat flour mixture into sugar mixture, alternating with milk, until combined. Transfer batter to prepared baking pan. Bake on center rack 33 to 35 minutes, until a toothpick inserted into center of cake comes out clean. Remove from oven; cool on wire rack 5 minutes. Invert cake onto wire rack; remove paper. Invert again onto a second rack set over waxed paper. Meanwhile, prepare glaze. Sift confectioners' sugar through a wire mesh sieve into a medium bowl; set aside. In a small saucepan, over medium heat, combine the cream, butter, and molasses; stir until butter is melted. Pour cream mixture into sugar; stir until smooth. Pour glaze over hot cake and, working quickly, spread evenly with a spatula to cover top. Let stand at least 4 hours. 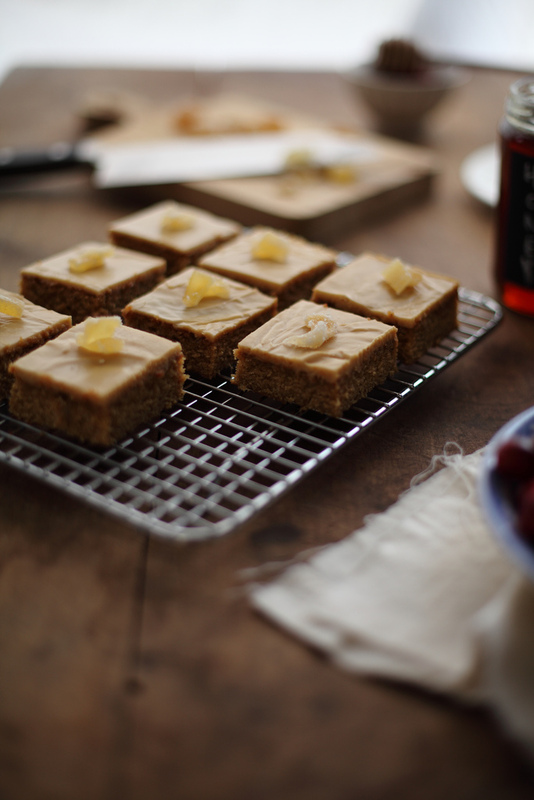 To neatly cut squares, place a ruler alongside one long side of cake. Beginning 1/16-inch from one narrow edge of cake, use the tip of a sharp knife to score the glaze in 2-inch segments. Reposition ruler on remaining sides of cake to mark 24 two-inches squares. Then, using a serrated knife, dipped in hot water and wiped dry between slicing, cut through at the score lines. Crisscross two strips on ginger on each square.